The Indianapolis Star is now on the iPad! 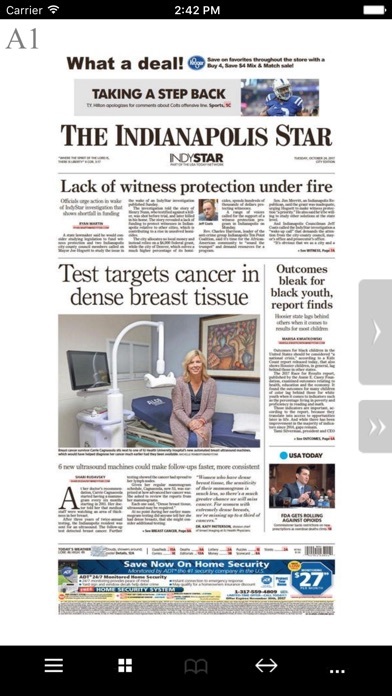 Introducing The Indianapolis Star Print Edition app, where subscribers can read The Indianapolis Star on an iPad with all the stories, photos and ads shown just as it appears in print. Subscribers can use their current account login to access current and back issues. App does not allow me to connect to my subscription. Chatting disconnected twice and Then gave up. The worst experience possible for reading a paper. Constant lockup’s and shutdowns. Very seldom is the app updated with bug improvements. Why pop-up ads for people paying for a subscription? Just subscribed...myreward for subscribing to the paper is a non-stop stream of pop up ads at the bottom of the screen? Why force people who are paying for a subscription to have to deal with this. It's really annoying and I'll be canceling very soon if this continues. Really easy way to read the paper! I love this app. I love how it still gives you the “feel” of the print edition but with this app I can control the size of the articles I want to read, it’s so easy to navigate, I love how you can continue stories in later pages and then jump right back to where you left. It’s got a lot of nice little features like expanding full screen, page and section navigation, you can even click articles and comics to get the zoomed, stand-alone version. My eyes aren’t what they used to be and this app really helps me! I can ignore the banner ad at the bottom easy enough. The Star has really good content and this makes it easier for me to read. So let me get this straight, I already pay for a digital subscription and now I have to deal with annoying flashy ads at bottom of the screen?!? Who the hell thought that was a good idea? Will not renew my subscription. If zoomed in and phone locks, it defaults back to full page. Double tap to zoom in doesn’t work half the time. It’s amazing just how much better the Louisville Courier Journal app works compared to the Indy Star. I use this app because I have a paid subscription to the Indianapolis Star. There are now banner ads that appear at the bottom of the screen. BAD IDEA! Loose the in app banner ads or loose a subscriber! There are already ads in the paper itself. 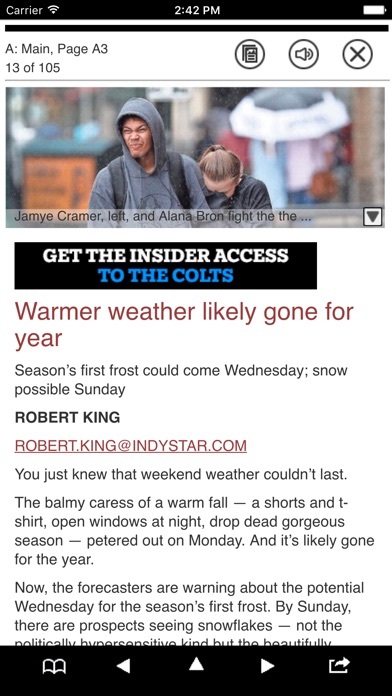 STOP pushing ADS (banners) on the INDY STAR PRINT EDITION iPad app. I pay for my subscription and DO NOT APPROVE of this annoyance. 29 days and counting down --- until I cancel may Indy News subscription which we have maintained since 1980. This is the worst app I have experienced in years. It won’t load properly, it doesn’t recognize my password I’ve used for many years and it’s terrible every possible way I am so disappointed.